Deep Silver has revealed a new four-player co-op mode for the upcoming shooter Homefront: The Revolution called Resistance Mode. We actually have a good hands-on look at it right here and I would encourage you to pop over and give it a read, because it sounds like a ton of fun. But before you go, why not watch the trailer? 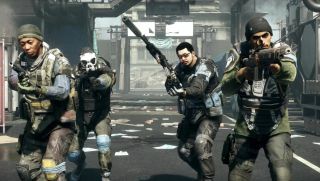 Resistance Mode looks like a fairly straightforward survival mode at first blush, with variable classes, weapon upgrades between rounds, and wave after wave of increasingly difficult enemies to deal with. But Deep Silver says the missions will be “narrative-driven,” and there will be a lot of them: The plan is to launch with a dozen Resistance Mode missions in the game, and then put out another 20 over the first year of release, all of them free. It's hard to say how far Resistance Mode will deviate from the standard "fight 'til you die" formula in actual practice, but the preview does make it sound like a blast—although I'm not sure the guy who got run down by our erstwhile hero and then yelled at for being irresponsible would share that perspective. In any event, I'm definitely looking forward to trying it myself. Homefront: The Revolution comes out on May 20.